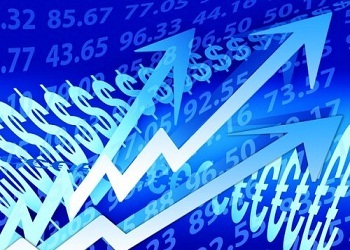 Why is divergence also beneficial for binary options trading? We can see this from a forex perspective. Basically, forex is one of the trading instruments in binary options. So between spot forex trading with forex in binary options, the analysis is not much different. 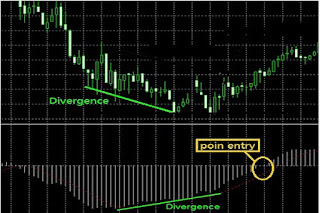 If for ordinary forex trading divergence has been widely used and relied on, the application of this method will also be effective for forex trading in binary options. Well, how do we apply divergence in binary options? First of all, we need an oscillator indicator to support the divergence strategy. The reason is none other than the basis of the divergence analysis itself. Easily, divergence is based on the difference from the actual price movement with the oscillator indicator. So if the price on the chart tends to rise but the oscillator decreases, this can be a sign of divergence. To get a picture of the high pattern (top or high point) and low (bottom or low point) on the price chart and the oscillator, you can use the help of the trend line. 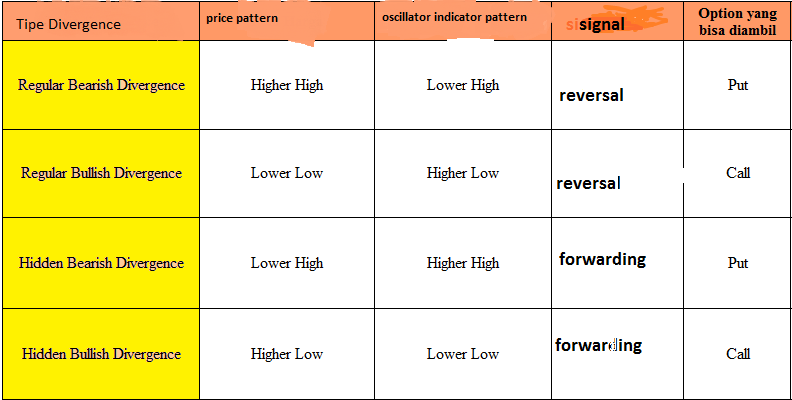 Talking about an oscilltor is certainly not free from indicators like RSI, Stochastic, CCI, MACD, and so on. Then, which is the most effective to use in a divergence strategy? The RSI (Relative Strength Index) can confirm stronger divergence signals with saturated levels at 30 (oversold) and 70 (overbought). 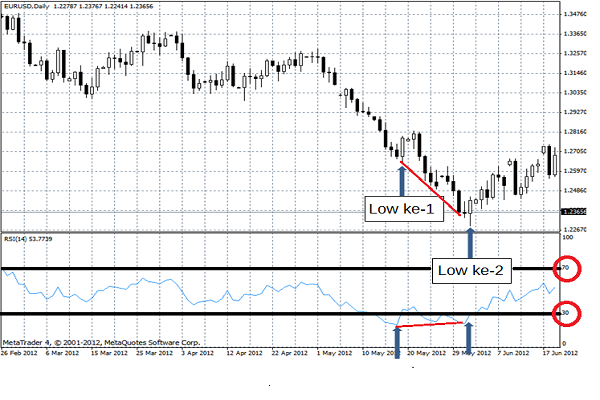 For example, a regular bullish divergence signal can be confirmed if the RSI is in the 30th area. On the contrary, a regular bearish divergence signal will be more valid if the RSI reaches the 70 area when divergence occurs. Look at the chart that the price is forming a lower low, but the RSI shows a higher low pattern. This is a regular indication of bullish divergence. Also note that the RSI is below level 30, which further confirms the opportunity to open the "call" option. Evidently then the price moves up after divergence is formed. It appears that the price is forming a higher high while the stochastic is showing a lower high pattern. This is a regular indication of bearish divergence that signals a reversal and a good chance for you to place the "put" option. Moment of entry can be taken when the Stochastic% K line cuts% D from top to bottom at the end of the higher low pattern. This method is one of the main trading methods with stochastic, and can be used to determine the correct entry position. After the crossing moment can be seen the price then drops sharply and gives you plenty of room to determine expiry time for your "put" option. If Stochastic looks more complex than RSI because it has 2 lines that need to be considered the intersection, then MACD can look even more complicated. In the default view of MT4, MACD consists of 2 components, namely the MACD area which is the difference between 12 EMA and 16 EMA, and the signal line which is actually the 9 SMA from the MACD area. In observing the divergence with the MACD indicator, you can pay attention to the direction of movement formed by the MACD area. 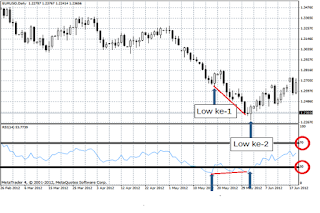 The picture above shows a regular bullish divergence signal, which is indicated by a lower low at the MACD price and higher high. This is a sign that the price will experience a trend reversal from bearish to bullish. To further confirm the entry on the "call" option, you can wait until the MACD area crosses to the positive area (above 0). This is one of the main methods for trading binary options with MACD. The MACD area that rises above level 0 indicates a trend change and is often used as a confirmation for trend-following traders. The expiry time recommendation on this strategy is between 1-4 hours, with the default MACD setting at 12-26-9, and the timeframe selection at 15M. Compared to other trading methods, divergence tends to be more difficult to understand. Beginners may often experience confusion when analyzing high and low patterns on the chart. The divergence signal still requires confirmation of price action or other indicators. 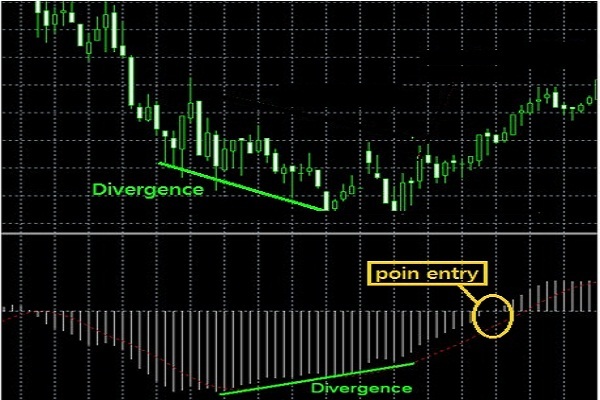 Recognizing divergence can be an important aspect of binary options trading. 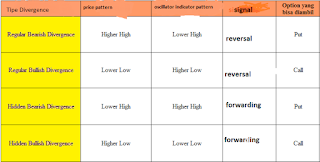 This trading method is able to provide an overview of the direction of price movements, not only from the general patterns that are formed on the chart, but also the trend strength analysis. In placing the "call" or "put" option, the price fluctuations and how long the price will be in the trend are the most important to ensure the success of trading binary options. Although it seems very promising, there is still a risk of false signals if you are not really familiar with the condition of divergence. For that, make sure you understand and test the trading strategy with divergence before using it for real trading on binary options. You can compare RSI, Stochastic, and MACD to find out which oscillator is the most potential for you. Broadly speaking, the RSI can provide a stronger divergence signal through oversold levels and overbrought. While Stochastic and MACD can find more potential entry points through the intersection of signal lines.